The Phrase 'A Big Fat Indian Wedding' is most suitable to the extravagant weddings of the opulent and the celebrities of the country. From decor to attire, food and entertainment the opulent weddings invite the guests to an extravagant experience and also create a buzz all over the world. Even the modest families plan lavish weddings in India with eye-catching decor, variety of food, music and dance, colorfully dressed guests etc. You can now imagine the extent of grandeur in the weddings of the opulent and celebs in India. Indian brides take inspiration from the extravagant wedding dresses of the Bollywood actresses and celebrities in designing their own. Such is the impact of the Indian celebrities and their wedding costumes on Indian women who love to follow latest trend and fashion while designing their wedding dresses. Stunning splash of color, intricate embroidery and stone work are some of the most attractive elements of a perfect wedding dress of the celebrities. Aishwarya Rai's wedding pictures were kept away from public view for quite some time. But without doubt on the special day the former Miss World was looking stunning in her traditional yellow and golden color Kancheevaram saree. The saree designed by the famous designer Neeta Lulla was decorated with Swarovski crystals and gold thread work. Decked with suitable jewelry and hair decorated with flowers, the stunning beauty's wedding attire was the star attraction. Shilpa Shetty's brilliantly and intricately designed red saree was the talk of the town after the wedding. It was valued Rs. 50 lakh at the time of the wedding. 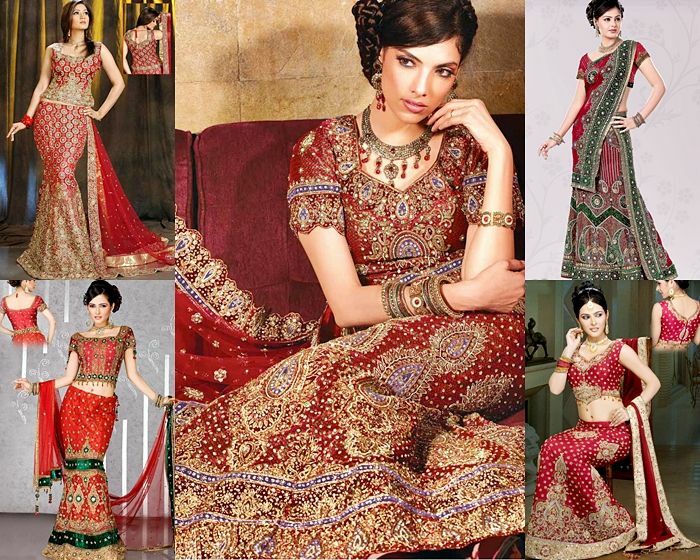 Designed by the leading designer Tarun Tahiliani the saree had 8000 Swarovski crystals. This gorgeous and breath-taking attire was complimented by the kundan jewelry, uncut diamonds and emeralds she wore on the special day. The bride and her wedding attire is the show stealer in any wedding. In Geeta Basra's sensational wedding with the star cricketer Harbajan Singh also, the show stealer was the gorgeous red Lehanga she wore for the occasion. The dress with grand embroidery, floral pattern and Gota patty work was also designed by Neeta Lulla. With matching kundan jewelry Geeta Basra looked gorgeous. Gali Janardhan Reddy's daughter's wedding; one of the lavish weddings in India at a cost rumored to be Rs. 500 crore was the talk of the town and attracted all kinds of controversies. The bride Brahmani was wearing a red Kancheevaram Half saree worth Rs. 17 crore. The bridal saree was full of gold zari and the complete work on the saree was made of 22 carat gold. The red gold saree was complemented by diamond jewelry she wore for the wedding. Cricketer Yuvaraj Singh and Hazel Keech's wedding ceremony was both a traditional Hindu wedding in Goa and a Sikh wedding in Chandigarh. Both were dressed traditionally and stylishly in their outfits designed to match and complement each others. The red Lehanga with maroon velvet choli in embellishments and chunni with golden work buttis was stylish yet traditional. Yuvaraj wore the matching velvet textured Sherwani with floral motifs in keeping with the Sikh tradition.